On Friday morning, we got out of the hotel at about 11am. 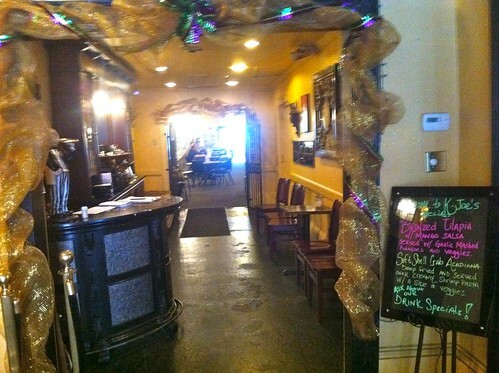 We considered going to Brennan's for breakfast, because we had had a splendid three-course breakfast there in 2011. We knew that this was our best chance for a big ornate breakfast like that, because we'd want to save our appetite for the Roadfood festival on Saturday and Sunday. But as splendid as the prospect was, it just did not call to us, and so we searched elsewhere. We looked in the window of Antoine's, but they didn't serve brunch on Friday, and Lori likes to start her day with breakfast. So we drifted across the street to K-Joe's, which is not listed on the Roadfood site, but which had provided outstanding red beans and rice at the 2010 festival. Lori asked if they were still serving breakfast, and the server replied, "until 2pm." Lori's kind of place! I ordered the cajun omelet, which the menu describes thus: "CAJUN OMELLETTE, a true New Orleans breakfast; ham, smoke sausage, bell pepper and onions. Topped with Creole sauce." 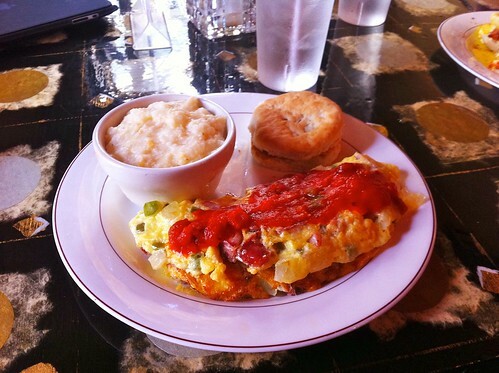 The omelette was very good, with strong flavors from the ham and sausage. The grits were unusual in that they tasted of fresh corn; I believe that they had a smattering of corn kernels mixed in. The biscuit was buttered and lightly toasted, which made it quite nice indeed. 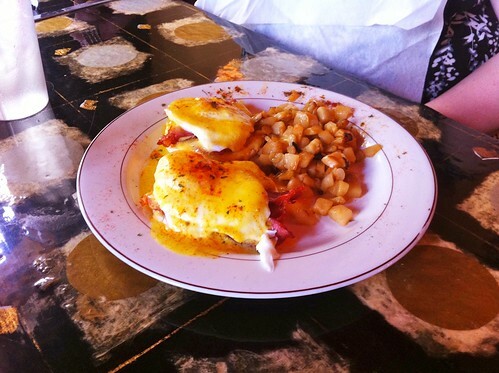 Lori ordered the eggs Benedict with hash browns. The eggs Benedict were good, but Lori would have preferred a creamier hollandaise and less of the paprika-based seasoning on top.